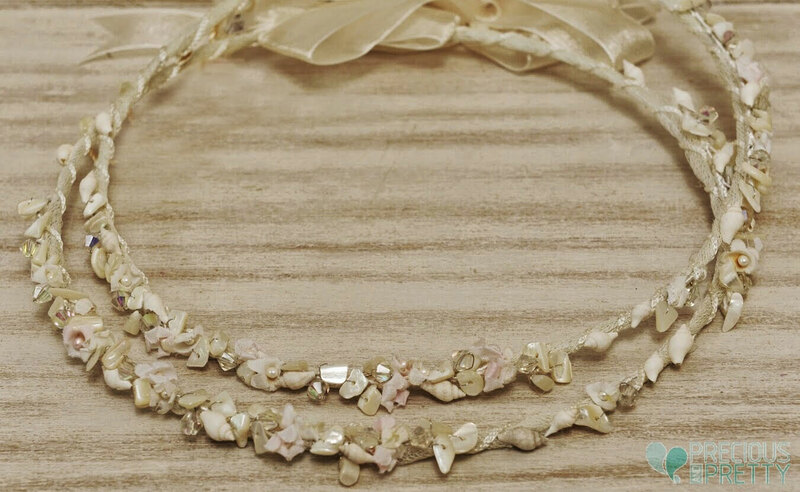 Handmade beach wedding crowns made in Greece, with fabric flowers, ivory beads, sea shells and crystals resembling Swarovski. Tied together with a satin ribbon. Ideal for summer weddings on the beach or in the islands. https://www.preciousandpretty.com/2019/01/beach-wedding-crowns-made-in-greece-1073.html Greek Wedding Favors|Orthodox Crowns|Stefana|Baptism Invitations Beach wedding crowns made in Greece 1073 Beach wedding crowns made in Greece with ivory beads, sea shells and fabric flowers. Product #: Greek Wedding Favors|Orthodox Crowns|Stefana|Baptism Invitations_5922671478590409123 5 stars out of 5 reviews.